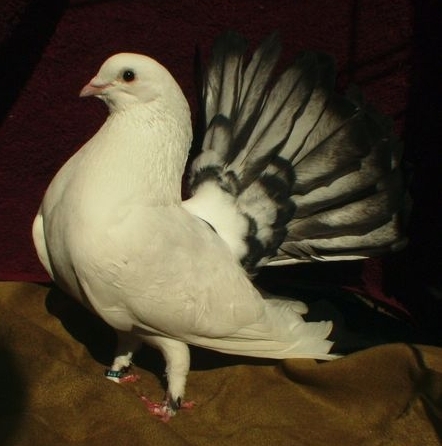 This gorgeous tailmarked fantail pigeon has been up for adoption for quite a while. Ya know...we need a list of shelters that accept Pigeons and Doves. That is one stunning pigeon. I'm surprised he hasn't been adopted. Thanks for posting the info on him, Jen. I hope success in finding him a home comes soon. That beautiful bird has been on Petfinder for many months. The previous fancy pigeon owner surrendered him due to some mismatched back feathers. Can you believe that? Sometimes I'm ashamed of my own kind. * That beautiful bird has been on Petfinder for many months. ** The previous fancy pigeon owner surrendered him due to some mismatched back feathers. *** Can you believe that? * I just can't imagine him being on the adoption list for so long. ** That's just down right disgusting. That pigeon is breath taking I can't believe its been up for adoption so long either. I checked Petfinder and Ares is still listed. I hope this beautiful bird can start the new year in a loving forever home. I'm shocked that such a beautiful fantail hasn't found a home yet! I can't imagine what is up with that. He's still there? I remember he was one of the first animals I looked at when petfinder first opened up. Well enough is enough! I just sent the rescue an email asking if they would ship, if they do maybe it would be easier to find him a home. Robin, I was going to do the same thing but with all my West Coast rescues, I have my hands full. I believe Ares is with other pigeons in the rescue facility. Please let us know. Also, how many other pigeons are available. All birds are beautiful but he is breathtaking! This is the info I recieved back from the STAR Rescue. I do believe that there are another 2(?) 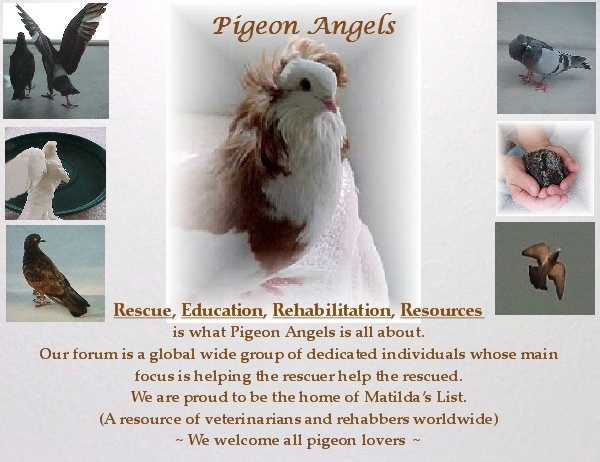 pigeons & 2 doves that need homes here also. If only she would ship I would think about adopting the fantail, but maybe if anyone has any contacts close to her we could get these guysa placed. Well, we've had some interest but I've been hoping we don't have to ship him. I know that's how most bird fanciers do it but I just have to think someone closer (whom I can visit myself and know that they are legit and not breeding, etc) would come along. It's not like they're taking up space and that we're in desperate need for them to leave, so waiting for someone not out of state didn't seem like a problem. Actually, they were MY birds but circumstances have changed over when I got them 5-7 years ago (back then, I had no rescue) and I didn't know I'd be in a position where they're basically just living here, another chore- they get no handling or stimulation, they just live in their little 6x4x4 cage hanging out. I've never placed birds like these guys before, just given them the best loving home I could, so I'm actually really anxious about them leaving because I just want to be sure they are taken care of. I've placed hundreds of animals... but they're mostly able to be neutered, and I don't have to even worry about breeders. Any help you can give on making sure they're going to good pet homes, I would appreciate it. Also, Ares gets all the attention but he lives with two others who really need a home as well- ideas on how to find good homes for the "less beautiful" birds (I love them all!) would be appreciated. I do need help if I'm to find them a better home, and appreciate that you contacted me. I totally understand We can only do so much i know this all too well. Wildcare, on Cape Cod also has birds in need of placement and Wildcare won't ship them either. Shipping makes me nervouse too but I understand that often it's the only way to get a bird where the bird needs to be so as to have a better quality of life. The part that frightens me the most, is the way the boxes are handled. The last time I mailed a bird was to Joe. I'll never forget how horrified I was when the clerk picked the box up and tipped it on end. I could hear Midnight and Ethal slip, slide and it made me feel terrible. I understand your feelings Charis and worry the same way you do. But if a wonderful home wants to adopt and the bird must be shipped I would ship rather than hold the bird back from a happy future life. The part that frightens me the most, is the way the boxes are handled. The last time I mailed a bird was to Joe. I'll never forget how horrified I was when the clerk picked the box up and tipped it on end. I could hear Midnight and Ethal slip, slide and it made me feel terrible. I can't imagine why in the world he would be tipping a box that contains live birds on it's end?? Just goes to show ya theres more dopes out there than we figured! I can understand rescues not wanting to ship because they want to meet the potential adopter and/or see where the animal is going to live. Many rescues will also take an animal back if the adoption doesn't work out for whatever reason. But if the pet is shipped it makes it difficult to get the pet back. But it could be a good way for an animal to get a great home. I just hope they all find fabulous forever homes. Thanks Robin for contacting the shelter. I can understand the anxiety the caretaker there is going through when she said she wants to find adopters closer home but looks like it's been a long time Ares and the other birds are up for adoption and if they haven't yet got any adopters nearby looking out, i guess it would be a good idea to ship them if they find someone willing to adopt them.